All the scientific activities of the meeting will take place at the Liège Congress Center (Palais des Congrès de Liège), Esplanade de l’Europe 2, B-4020 Liège, Belgium, www.palaisdescongresliege.be. Mouse over to zoom, click to enlarge to original size. Ctrl-S to save the image. Palais des Congres: front view. 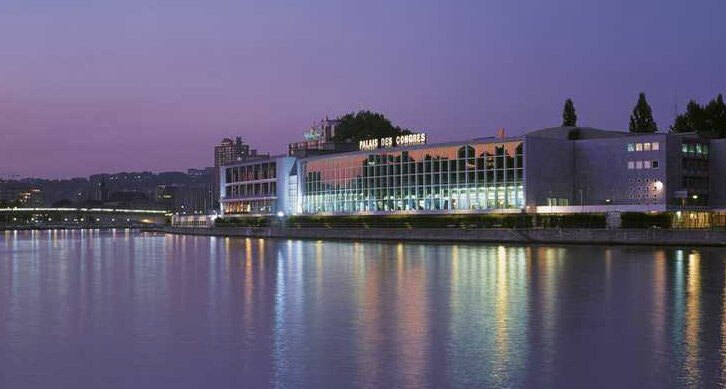 Palais des Congres: river view. The plenary lectures and the Young Investigator award lectures will be in the Elisabeth Lecture Hall (“Salle Elisabeth”) situated at the level 1. The parallel symposia will take place in the Elisabeth lecture hall (Level 1) and in the Mosane rooms (Mosane 3, Mosane 4, Mosane 5/6 and Mosane 8/9) situated at the level -1. Exhibition, poster presentations and coffee break will be at the Level 1 in the “Grand Foyer” near the stairs connecting every levels of the congress center. 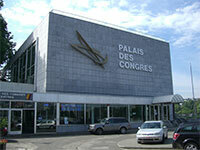 The registration desk will be placed in the main entrance of the congress center on Monday September 2 afternoon. From September 3 to 6, the desk will be in the “Grand Foyer”. The conference language will be English with no translation facilities available. 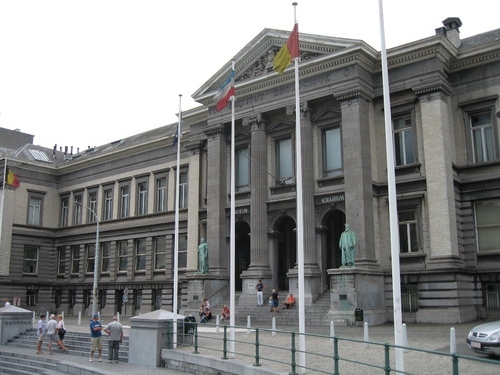 The Welcome Reception on Monday September 2 will take place at the Liège Aquarium situated in the Institute of Zoology. Drinks and snacks will be offered at the entrance. The Institute of Zoology of the University of Liège is situated in Quai Edouard Van Beneden, just 5 min away from the Congress Center. This will be the occasion for a pleasant walk along the Meuse River. 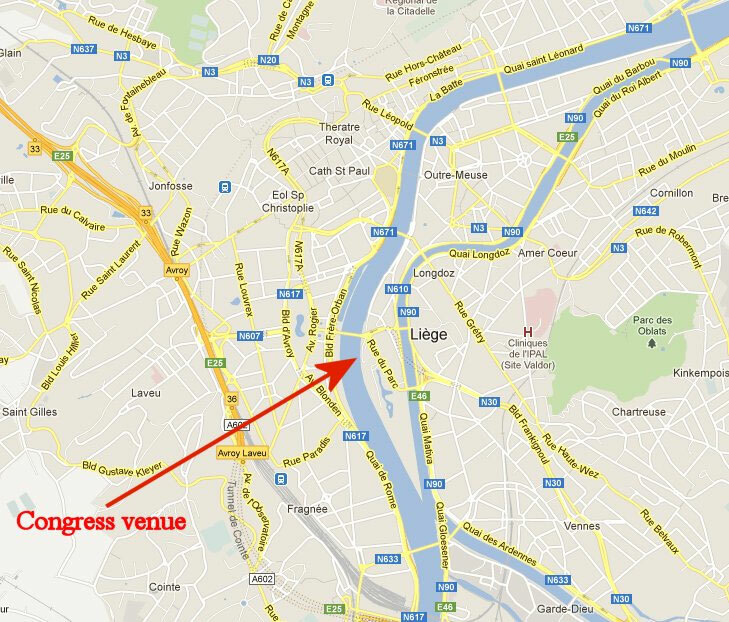 Click on the image to get a map including Liège Aquarium and Congress Centre. The Conference Gala Dinner and Medal Award Ceremony will be organized on Thursday September 5 at 20h00 in the Congress Center..
During the Gala Dinner, the ESP Medal for “Excellence in Photobiological Research and dedication to the ESP” will be awarded. The recepients of the “Young Investigator Awards”, Dr. Kathryn Dixon (Australia) and Dr. Abishek Garg (Belgium) will be honoured. They will give their lecture on Tuesday September 2 at 9h00 and 14h00, respectively. Projection will be via a Microsoft office powerpoint software with a standard data projector. All oral presentations must be pre-loaded in advance. Speakers should go themselves to the registration desk where instructions will be given to upload their presentation on the computers placed in every lecture room. Presentations should be provided on an USB flash drive. Speakers with presentation on a MacOS system are invited to contact themselves the chairpersons during the break before their lecture in their respective room for a final check. Speakers are kindly requested to strictly adhere to the time given in the programme schedule. Posters should be prepared in portrait format and they cannot exceed 0.95 m width and 2.00 m height. No pins can be used to fix the posters on the board. Self-adhesive tape will be provided. Each poster will be assigned a number which can be found in the abstract book and must be mounted on the poster board having the same number. Poster can be mounted starting on Monday September 2 afternoon and must be removed at the latest on Friday September 6 at 17h00. The posters should remain on display throughout the whole meeting. There will be only one poster session on Wednesday September 4 in the “Grand Foyer” from 14h00 to 16h00. Presenters must be available for the duration of the poster session. 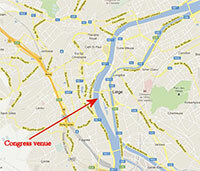 Restaurants, fast-food restaurants, bars are located very close to the congress center (walking distances). At 7-8 min walk, the shopping center “Mediacité” (7 Boulevard Raymond Poincaré, 4020 Liège; www.mediacite.be) offers French, Italian, Chinese, vegetarian Restaurants. At 10 min walk in the direction of the Railway station, the “rue des guillemins” offer many National or International-type restaurants, coffee bars and pubs. At 20-30 min walk, the participants will find their appropriate Restaurants and bars in the Liège City Center. Hotels in Liège can be directly booked by participants using appropriated websites such as booking.com or expedia.com. Pay attention that September is still a tourist period in Belgium and hotel booking must be done well in advance. Below you will find a selection of hotels where privileged prices have been offered to ESP13 participants. Alliance Hotel (****) situated next to the congress center. Please see and fill out the attached form. Eurotel (**) situated at 5 min walking from the congress center: 70 €/night for a single room and 90 €/night for a double room including breakfast and taxes. Use the code ESP2013 when booking. Univers Best Western Hotel (***) 72€/night for a single room and 83 € for a double room including breakfast, wifi and taxes. Use the code ULG-ESP2013 when booking. Hotel de la Couronne(***) 88€/night for a single room and 98€/night for a double room including breakfast, wifi and taxes. Use the code ESP2013 when booking. Crowne Plaza Hotel (*****) Please see and fill out the attached form. Mercure Hotel (***) Please see and fill out the attached form. Ibis Hotel (***) 85 €/night for a single room and 99 € for a double room including breakfast, wifi and taxes. Please use the code ULG-ESP13 when booking. Brussels International Airport (BRU). BRU offers direct regular flights from many international destinations within or outside Europe. BRU also has low cost flights operated by Easy jet. The terminals offer all the requested facilities and services. A train station is located in the basement of the main terminal. Charleroi South Brussels Airport (CRL). CRL offers low cost flights operated by Ryanair, Jetairfly and Wizz and major cities in Europe. The Airport bus will connect you to the Charleroi Railway station. A single ticket can be used for the bus and the train between Charleroi and Liège. Maastricht-Aachen Airport (MST). MST offers both regular and low cost flights (operated by Ryanair). A personal travel plan can be created via the site: www.9292ov.nl. Bus transportation will bring you to the Maastricht Railway station. Frankfurt International Airport (FRA) is also well connected to Liège via ICE high speed train. The journey between FRA and Liège is around 3h. Liège Railway station is located in the middle of the European highspeed train network. Thalys high speed trains directly connect Liège to Paris, Amsterdam and Cologne. TGV high speed trains directly connect Liège to Lyon, Marseille, Nice, Montpellier and Perpignan. ICE high speed trains connect Liège directly to Cologne and Frankfurt. Eurostar Brussels Railway Terminal is connected to Liège by regular trains every 30 min from 5 am to 12pm. The Liège Railway station is located at a 15 min walk to the Liège Congress Center. To access to hotels situated in the city center buses and taxis are available near the main railway entrance. Liège is connected to all major European cities by highways offering a rapid link with Eastern, Southern and Northern European cities. Car parking is offered for free at the Liège Congress Center and at the Alliance Hotel.